I’m not a list person – until Christmas. Now I have lists. 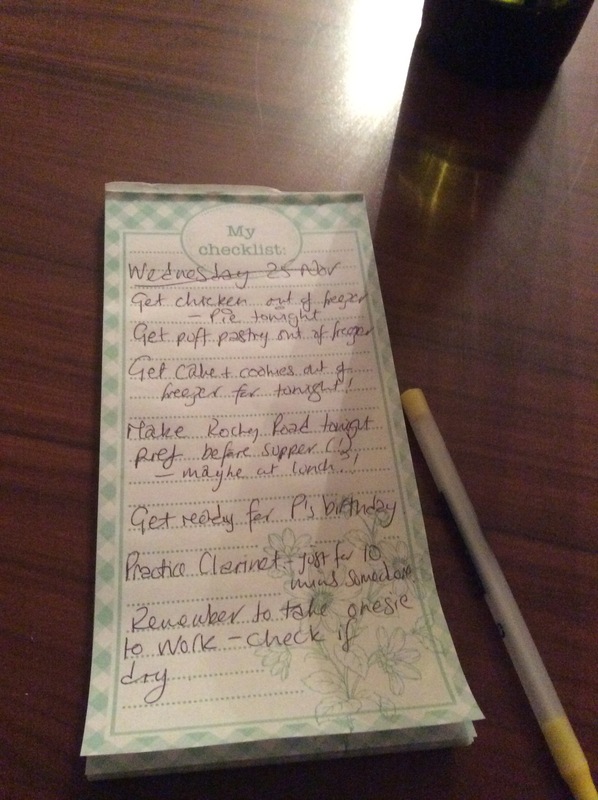 There are lists from the children, my list of things-I’d-like-to-bake-this-Christmas, shopping lists and a daily to do list. I know there is limited time to get everything done in time for the big day. The due date for returning books at the library is already at December 22, so I have a tendency to feel that time is going faster than it actually is. I have to remind myself that it is only the beginning of December, but the countdown has well and truly begun. Except I don’t want to think about it like that. I’d rather call it a count up to Christmas and enjoy the whole festive season. It was a good feeling to get up this morning and put seasonal music on – good old carols along with modern Christmas songs. The decorations are up, all that is missing is the tree which we will go out to choose and chop down at the weekend (the kids are hoping for snow as it adds a little magic to the hunt for the perfect tree). Then we’ll decorate it together, and sit down to watch a Christmas movie. Haha, it all sounds so perfect, but I can guarantee that there will be some tension, frozen feet and hands and a few disagreements along the way. For all of that I still look forward to those family traditions and the spending time with others as well – sharing Christmas round a bit. I don’t want the stuff of Christmas to drown out the good news of Christmas. This is always a battle as there’s a lot of expectation – and as parents we want to have happy kids on Christmas morning. I find myself always saying, ‘It’s not about the presents!’ as those lists get sent to me on Facebook these days or printed out with detailed descriptions so we don’t get anything wrong. It’s helpful, quite amusing and a little stressful all at the same time. It’s not about the baking either. I have to remember not to spend too much time in the kitchen working myself into a production frenzy. It’s about celebrating the greatest gift to mankind in the unexpected form of a baby in a manger…and that is what I love, that is who I love, the most at Christmas, and why our celebrations are exuberant.